Arrowed, the donors and FUNAAB Alumni, Mrs. Bolanle Ogbodu and Mr. Ayokunle Awosika with the Dean (COLAMRUD), Prof. Segun Apantaku, Prof. (Mrs.) Carolyn Afolami, Prof. Wale Dipeolu (Holding Mic), an executive of FUNAAB Alumni Association, Dr. Sam Wobo and Prof. Siaka Momoh. A confirmation that Lecturers rewards are no longer in heaven played out on Friday as two Alumni of the University donated 20 valuable books, which they purchased abroad to the Department of Agricultural Economics and Farm Management, College of Agricultural Management and Rural Development (COLAMRUD). 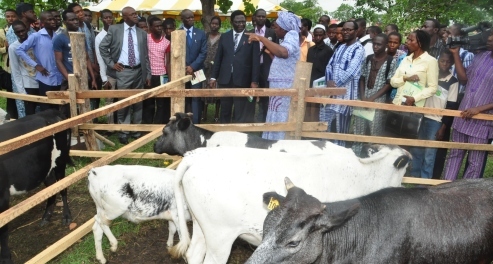 The donors, Mrs. Bolanle Ogbodu and Mr. Ayokunle Awosika, who graduated from the Department of Agric Economic and Farm Management (1993 set), at the then Isale Igbein Campus, said the gesture was in honour of their beloved Lecturer, Professor Wale Depeolu, who they still fondly called “Uncle Wale”, in memory of his days as a young lecturer. Incidentally, Professor Dipeolu is the current Head of Department (H.O.D), Agric. Economics and Farm Management (AEFM). Explaining the rationale behind the donation at a light presentation ceremony held in AE&FM, Mrs. Ogbudu, who during her students days was known as Bolanle Akande said it was triggered by Professor Dipeolu leadership of the Department. According to her, “when we heard that Uncle Wale (Professor Dipeolu) is the HOD, we felt the urge to support our former beloved lecturer. As a young lecturer then, Uncle Wale was a cane and carrot lecturer”. He was very friendly with us as students and at the same time very punitive if you fail to do what is expected of you. We always enjoy his lecture because he is such a brilliant lecturer”, Bolanle who works in oil company added. Corroborating her, Mr. Ayokunle Awosika who is Ogbodu course and classmate stressed that the gesture was part of their genuine intention to plough back into their Alma Mater, adding that it was at the instance of their “amiable” lecturer, Professor Dipeolu. Awosika, a big time maize farmer and contractor stated that the gesture was a token in appreciation of Professor Dipeolu, COLAMRUD and the University at large, assuring that they hope to do better in future. Receiving the donation on behalf of the Vice Chancellor, Professor Olusola Bandele Oyewole, the Dean of COLAMRUD, Professor Segun Apantaku described the donors as exemplary and emulatable, urging others Alumni to take a cue from them. Speaking in the same vein, veteran Senior Lecturer of the College, Professor (Mrs.) Carolyne Afolami and Professor Siaka Momoh, among others commended the gesture and prayed God to reward their labour of love. Responding, Professor Wale Dipeolu gave glory to God for the life of Alumni and undergraduates of the Department, COLAMRUD and the University at large. He described the gesture in his honour as a challenge to do more for the betterment of students, the College and the University at large. Meanwhile, another old student, Mr. Henry Ndiulo, according to Professor Dipleolu has fulfilled his promise by sending a sum of money to AEFM to purchase books.